The colon is released from the lateral sidewall by incising the white line of Toldt. Dissection is carried out from the splenic flexure to the iliac vessels. The colon is reflected medially using the back of the hand, while the fingertips help dissect the mesocolon off of the anterior aspect of Gerota's fascia. Dissection is continued in the cephalad direction, freeing the splenic flexure and releasing the splenorenal ligaments. The lateral attachments from the body sidewall to the spleen are now released up to the level of the gastric fundus, which allows the entire spleen and splenic flexure to fall medially. Lateral attachments of the kidney to the body sidewall should be preserved, as these attachments are used for counter traction, which aids in the medial dissection of the renal hilum. The plane between the tail of the pancreas and the anterior aspect of Gerota's fascia is then developed, which allows the tail of the pancreas to rotate medially with the spleen. The back of the hand is used as an atraumatic retractor on the spleen and the pancreas while the fingertips aid in dissection. Care is taken to leave the entire anterior aspect of Gerota's fascia intact. The colon and mesocolon are mobilized medially to allow identification of the aorta and renal hilum. Investing tissue overlying the hilar vessels is grasped with the fingertips, retracted anteriorly and a plane between these tissues and renal vein is developed using the harmonic scalpel or scissors. Once the anterior wall of the renal vein is exposed, meticulous dissection allows identification of both the gonadal vein and left adrenal vein entering the renal vein. These veins are dissected free of their surrounding tissues and doubly clipped both proximally and distally. FIGURE 5 ■ Right-sided nephrectomy. FIGURE 6 ■ Left-sided nephrectomy. At this point, the surgeon must not be tempted to continue dissection of the renal vasculature from this anterior approach. The key to success of the hand-assisted laparoscopic nephrectomy technique is obtaining the vascular control from a posterior approach, which allows the fingertips to surround the renal hilum, helping with palpation, dissection, and control of the renal artery and vein. the case. In other cases, the anatomy may be favorable for dividing the renal vein proximal to the adrenal vein, obviating the need for division of the adrenal and gonadal veins as long as the surgeon plans on removal of the adrenal gland with the kidney. At this point, the surgeon must not be tempted to continue dissection of the renal vasculature from this anterior approach. The key to success of the hand-assisted laparo-scopic nephrectomy technique is obtaining the vascular control from a posterior approach, which allows the fingertips to surround the renal hilum, helping with palpation, dissection, and control of the renal artery and vein. In a very rare case, the main renal artery will be easily accessible anteriorly and should obviously be ligated and divided at this point in the procedure. Dissection now continues at the most inferior lateral portion of Gerota's fascia, identifying the body sidewall and psoas muscle. The fingertips and the dissecting instrument of choice, either electrocautery scissors or harmonic scalpel, are used to reflect the perinephric fat in a medial and anterior direction off the psoas muscle. The surgeon works from a lateral to medial direction, coming across the gonadal vein, which is doubly clipped proximally and distally with hemoclips and divided. If a radical nephrectomy is performed, the ureter is also identified, clipped, and transected. Obviously, during a nephroureterectomy, the ureter is left intact. If a donor nephrec-tomy is being performed, the periureteral tissue is left adjacent to the ureter as well as leaving the ureter intact, and dissection of the ureter with all of its surrounding tissue is continued into the true pelvis below the iliac vessels. The surgeon continues reflecting the inferior pole of the kidney, adjacent perine-phric fat and overlying Gerota's fascia anteriorly and medially, releasing the posterior and lateral attachments to the body sidewall and posterior wall. All lateral attachments are now released up to the level of the adrenal gland, as the kidney is reflected anteriorly and medially with the back of the hand. Care must be taken not to enter Gerota's fascia. As the lateral attachments to the inferior aspect of the diaphragm are encountered, the surgeon must be careful not to perforate through the diaphragm. If perforation occurs, rapid loss of pneumoperitoneum will occur resulting in a tension pneumothorax. Perforations can be closed using hand-assisted laparoscopic suturing techniques; conversion to open nephrectomy may be necessary. After releasing all lateral and posterior attachments, the kidney can be rolled anteriorly and medially, exposing the posterior aspect of the renal pedicle. The kidney should then be rolled back to its normal position and the tips of the second and third finger are placed just above the exposed anterior aspect of the renal vein. Using the thumb and dissecting instrument, the kidney is now rolled anteriorly and medially and the thumb is placed on the posterior aspect of the renal vessels. This maneuver helps identify the renal artery by direct palpation and allows for presentation of the artery to the dissecting instruments. Additionally, if bleeding is encountered the fingers can compress the pedicle achieving rapid hemostasis. Using curved electrocautery shears, a Maryland dissector or a harmonic scalpel to dissect the surrounding lymphatic tissue, the posterior and inferior aspects of the renal artery are exposed. Oftentimes, a lumbar vein is seen coursing across the posterior aspect of the proximal renal artery. This lumbar vein can complicate expos-ure and dissection of the renal hilum, as it may tether the renal vein or obscure the renal artery. In these situations, the lumbar vein must be clipped and divided. 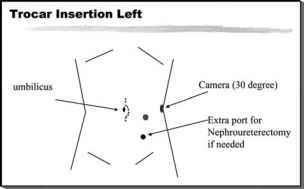 Following this, a right angle dissector is passed around the renal artery, completely freeing the vessel from all remaining attachments. The artery can be controlled using either three locking clips, two proximally and one distally, or by using an endoscopic linear stapling device. 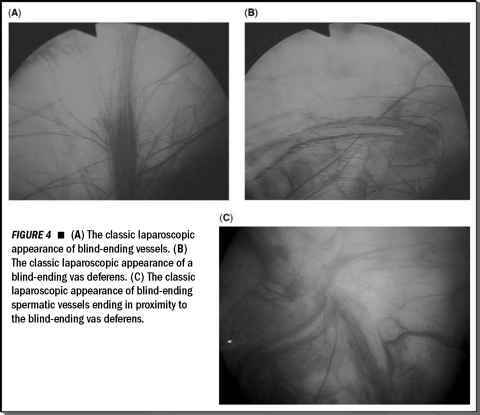 After the renal artery is divided, the renal vein is freed of all surrounding lymph-atic and connective tissues, and controlled using an endoscopic linear stapling device or large hemoclips. When the endoscopic stapler is used, great care must be taken not to engage any previously placed clips in between the jaws of the stapler. Both visual inspection and palpation with the hand assures that the stapler has not engaged any extraneous tissue or clips. Engaging clips in the jaws of the stapler will cause the device to misfire, resulting in a disruption of the staple line and significant bleeding. If the adrenal gland needs to be removed with the left kidney, attention is now directed to the most superior phrenic attachments. With the spleen completely mobilized medially, diaphragmatic attachments are identified and controlled using hemo-clips or the harmonic scalpel. There is usually a single artery originating from the diaphragmatic attachment, which must be adequately controlled with the harmonic scalpel or clips. The remaining vessels can usually be divided using the harmonic scalpel. Care must be taken to identify any accessory phrenic veins that may exist, coursing from the diaphragm along the medial aspect of the adrenal gland toward the renal vein. These structures can be easily mistaken for the adrenal vein when dissecting in the region of the superior aspect of the renal vein. The superolateral attachments from the adrenal gland to the body sidewall are left intact and the medial attachments to the aorta are divided using the harmonic scalpel and clips when necessary. The remaining superolateral attachments and posterior attachments are now divided using the harmonic scalpel or electrocautery scissors and the specimen is completely freed. If the adrenal gland is to be left intact, use visual inspection and palpation with the fingertips to locate the groove separating the adrenal gland from the kidney. The attachments between the adrenal gland and the superior aspect of the kidney are divided using the harmonic scalpel. If the adrenal vein has not already been divided, it should be doubly clipped proximally and distally, and sharply transected. Usually, a single large arterial branch originating from the renal artery feeds the most inferior lateral aspect of the adrenal gland. Hemoclips can be used on this vessel for adequate hemostasis. Once dissection is complete, the kidney is removed through the hand incision. Oncologic principles are no different in the hand-assisted technique from that of open surgery. The specimen is delivered intact, without the need for morcellation, preserving the pathologic integrity of the specimen. The hand is placed back into the abdomen and pneumoperitoneum is re-established. Adequate hemostasis should be assessed at lower insufflation pressures (5-8 mmHg) confirming vascular control of all arterial and venous structures. Renal hilar vascular stumps are re-examined and any bleeding staple lines or vascular stumps can be controlled with laparoscopic suture ligation. The operative technique is a modification of the above description. After the anterior wall of the renal vein is identified, Gerota's fascia is entered along the medial inferior aspect of the kidney. The entire inferior aspect of the renal capsule is identified. Perinephric fat is released from the capsule using either electrocautery shears or the harmonic scalpel. The entire anterior aspect of the renal capsule is now exposed and the inferior and lateral perinephric fat is also cleared away. The adrenal gland is now released from the medial superior aspect of the renal capsule using the harmonic scalpel. The adrenal vein is identified, doubly clipped proximally and distally and sharply divided. Usually, there is one large arterial branch coming off the renal artery, feeding the lower aspect of the adrenal gland, which requires control with hemoclips. The gonadal vein is now clipped and divided. Ureteral dissection is now accomplished, leaving as much periureteral tissue with the ureter as possible, hopefully preventing subsequent ischemia of the transplant ureter. Ureteral dissection is continued into the true pelvis, distal to the common iliac vessels. The ureter is not divided until later in the procedure, just before division of the renal vasculature, thereby preventing leakage of large amounts of urine into the wound, which will compromise exposure and visualization. The posterior and remaining lateral attachments are now divided and the kidney is rolled anteromedially using a similar maneuver as described in the above left-sided operative technique. Great care must be taken not to place the renal artery on stretch, as this can cause both spasms of the renal artery and potential intimal disruption. Lumbar veins are now identified originating from the renal vein and usually coursing over the proximal aspect of the renal artery. Using Maryland and right angle dissectors, the veins are isolated, controlled using hemoclips, and sharply divided. The renal artery should now be completely freed from surrounding tissue and ready for division. The remaining posterior and inferior attachments to the renal vein are now divided and the renal vein should be completely freed proximally to the level of the vena cava. The renal artery is divided using the linear stapling device with a vascular load or secured with locking Weck clips and divided distal to the clips. The linear stapling device with vascular load is used to divide the renal vein at the level of the vena cava. The kidney is promptly removed and placed in iced preservation solution. After insertion of the hand device and trocars as previously described, the liver retractor is inserted and the liver is retracted medially. The right lobe of the liver is released from the body sidewall by incising the triangular ligament and, if necessary, the anterior and posterior divisions of the coronary ligaments. There may also be significant attachments between the undersurface of the right lobe of the liver to the anterior/superior aspect of Gerota's fascia that must be released using the harmonic scalpel. With the liver adequately mobilized medially, the attachments of the hepatic flexure to the overlying Gerota's fascia are released using the fingertips to develop pedicles, which are transected using the harmonic scalpel. The duodenum is now identified. If the vena cave is covered by the duodenum at the level of the renal hilum, a standard Kocher maneuver is performed using sharp dissection, mobilizing the duodenum medially off of the underlying renal hilum and vena cava. Investing tissue over the vena cava and renal vein is released and the anterior wall of the renal vein is skeletonized. The tendency would be to continue dissection on the renal hilum and vasculature at this time, but the surgeon should remember that it is imperative to obtain vascular control from the posterior approach. Posterior exposure of the renal hilum is obtained by releasing all attachments of Gerota's fascia and perinephric fat to the body wall and rotating the kidney anteriorly and medially. We start this part of the dissection by directing our attention to the perin-ephric fat inferior to the lower pole of the kidney. Using fingertip dissection, the psoas muscle is identified and the fingers are passed lateral to medial raising the most caudal attachments of the perinephric fat off the psoas muscle. This large pedicle of tissue may include the right gonadal vein and ureter. The entire pedicle can be divided using an endoscopic linear stapling device. Alternatively, individual pedicles of fat can be divided using the harmonic scalpel, while the gonadal vein and ureter are individually clipped and sharply divided. In some cases, the gonadal vein can be gently retracted medially and division of the vein is unnecessary. Attachments of Gerota's fascia and perinephric fat to the lateral and posterior body sidewall are released using the harmonic scalpel or electrocautery shears. With the hand placed posterior to the kidney, the kidney is elevated. Any remaining inferior medial attachments to the vena cava or lower pole accessory veins are identified and secured using clips or the harmonic scalpel. The second and third fingers are now curled behind the renal pedicle, allowing identification of the renal artery. Using gentle traction with the index finger, the artery can be pulled inferiorly and dissected free of surrounding lymphatic tissue using the harmonic scalpel, Maryland dissector, or right angle dissector. The artery can be controlled using locking clips or an endoscopic stapling device with a vascular cartridge. The renal vein is dissected free from surrounding lymph-atic and investing tissues and transected using the endoscopic stapling device. If the adrenal gland needs to be removed with the kidney, the liver must be aggressively mobilized medially. The most superior phrenic attachments and vessels feeding the adrenal gland should now be controlled and ligated with clips or the harmonic scalpel. The superolateral attachments should be left intact and dissection should continue along the vena cava, releasing medial attachments. The adrenal vein will now be easily identified and should be ligated using large hemoclips and sharply divided. The remaining posterior and lateral attachments can easily be transected using the harmonic scalpel. If the adrenal gland does not need to be removed, use visual inspection and palpation with the fingertips to locate the groove separating the adrenal gland from the kidney. The attachments are divided using the harmonic scalpel.